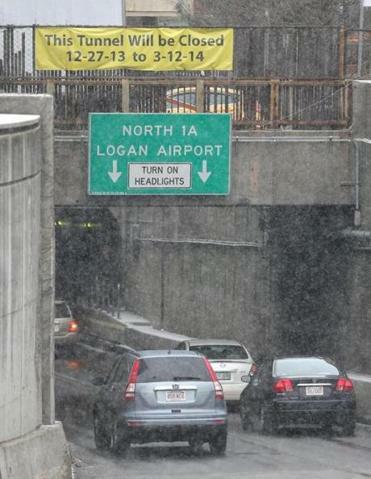 Callahan Tunnel closure begins at 11 p.m. The Callahan Tunnel shuts for repairs starting Friday night. Consider this the big lump of coal in our collective civic stocking two days after Christmas: The Callahan Tunnel closes for repairs for the better of part three months starting at 11 p.m. Friday. The 30,000 vehicles that use the tunnel on an average day will have to head for the Ted Williams Tunnel, Route 16 to Route 1A, the Tobin Bridge, or the South Boston Bypass until the Callahan reopens March 12, Massachusetts Department of Transportation spokesman Mike Verseckes said. “We expect a couple of days or so for folks to get acclimated,” Verseckes said. Large signs alerting drivers to detours were expected to appear on southbound Interstate 93 just north of the city Thursday night. Service on the MBTA Blue Line will increase to help ease delays. The Bowdoin Station will stay open longer, from 5:15 a.m. to 12:30 a.m., and an additional train will run throughout the day. The Silver Line will also be adding an extra bus for airport service. Construction workers will be repairing the deck, wall panels, and vents of the 52-year-old tunnel. The last time any major repairs were made on the Callahan was in the early 1990s. After a wall panel fell a year ago, MassDOT determined it was time for a full rehabilitation, Verseckes said. “Closing it entirely allows access to work around the clock,” Verseckes said. The main challenge MassDOT faces is blunting the impact on East Boston residents and those using the airport, Verseckes said.